A study by the universities of Manchester and Liverpool observing monkeys has found that those in the middle hierarchy suffer the most social stress. Their work suggests that the source of this stress is social conflict and may help explain studies in humans that have found that middle managers suffer the most stress at work. 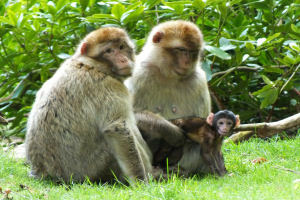 Katie Edwards from Liverpool’s Institute of Integrative Biology spent nearly 600 hours watching female Barbary macaques at Trentham Monkey Forest in Staffordshire. Her research involved monitoring a single female over one day, recording all incidences of social behaviour. These included agonistic behaviour like threats, chases and slaps, submissive behaviour like displacing, screaming, grimacing and hind-quarter presentation and affiliative behaviour such as teeth chatter, embracing and grooming. The following day faecal samples from the same female were collected and analysed for levels of stress hormones at Chester Zoo's wildlife endocrinology laboratory. Another key aspect of the research was noting where the observed monkey ranked in the social hierarchy of the group. The researchers found that monkeys from the middle order had the highest recorded levels of stress hormones. The research findings have been published in the journal General and Comparative Endocrinology. Katie is currently based at Chester Zoo where she is studying hormone levels in relation to behaviour in a bid to encourage Black Rhinos to reproduce more frequently. Katie Edwards is available for interviews. Images of the monkeys in the study can be obtained from the press office. The paper “Associations between social behaviour and adrenal activity in female Barbary macaques: consequences of study design” has been published online in the journal General and Comparative Endocrinology. Trentham Monkey Forest is based in Staffordshire and is home to approximately 140 Barbary macaques that roam freely across 60 acres of woodland.